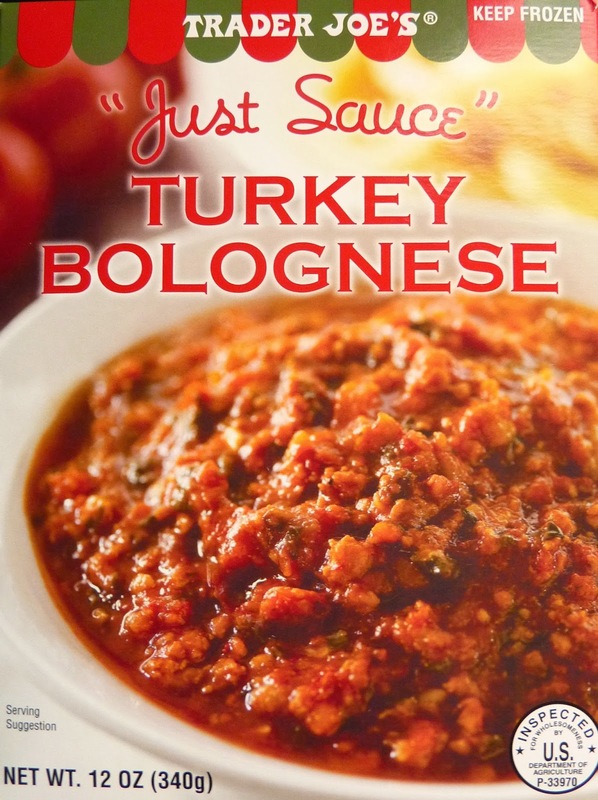 As the package boldly indicates, this is indeed "just sauce." And in case there's still some confusion about the issue, we'd just like to clarify that this item does NOT come with bread, it does NOT come with crackers, NOR does it come with any form of pasta. It's just sauce. But unless you enjoy eating sloppy joe filling by itself, you'll probably want to supply your own bread or bread-like substance. I suppose this dish could be likened to a beanless chili of some kind and consumed via spoon, but really...I recommend eating it with bread. Pasta would work, too. In fact, Bolognese sauce traditionally pairs with pasta. As the name would suggest, it originates from Bologna, Italy. And that reminds me of my wife's childhood nickname: "Sonia Bologna," which I affectionately resurrect from time to time when I feel like I need to be smacked. But that's neither here nor there. 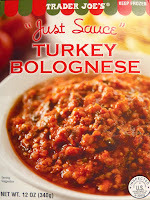 I liken this sauce more to a sloppy joe filling than to a pasta sauce since most pasta sauces I've experienced either have a tomato-esque flavor, as in Marinara sauce, or they're creamy, as in Alfredo sauce. This sauce is meaty. Turkey is definitely the main attraction here. The only other flavor that jumped out at me was licorice. Black licorice. I looked on the ingredients list, and of course, there's no black licorice. However, dried fennel is listed. I began Googling "fennel tastes like..." and just as I expected, the search box auto-completed my inquiry with "licorce" and "black licorice" before I even finished typing. Voila. I knew I tasted something licoricey. Granted, fennel and black licorice are not the same flavor, but they are extremely similar. Here's a picture of the product by itself. It's not much to look at. It brings to mind things that should never ever be mentioned on a food review blog. Try it on pasta if that floats your boat. But I say try it on bread. Just think of a decent sloppy joe, replace the beef with lean-ish turkey, and add black licorice flavoring, and that's pretty much what you have here. Both Sonia and I wished it had beans, onions, or some other substance to it, but I guess then it would be chili. I give it 3 out of 5 stars. Sonia gives it 3.5. We add it to a can of TJ's Marinara Sauce and end up with a pretty damn good pasta sauce. I hate licorice. I love your googling fennel tastes like. LOL. I'll still try it, but definitely after having thrown in another can of something more bland. Awesome suggestions, Jill. We'll have to try that next time. 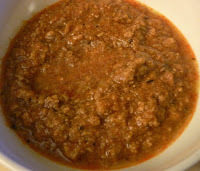 FWIW I have been to Bologna and had authentic bolognese sauce... it's certainly nothing like we are used to in tomato sauce. They emphasis is on the ground meat and often uses just some tomato paste and then finishes w milk... I've got to say I was not a fan of the 'real stuff' - chef boyardee is not as far off a you'd think from bolognese flavor wise! crazy! loving the blog btw!! Thanks for the compliment and great info, Kate! I'm a fan of this sauce. Pour over a little penne (the ground meat pairs well with this style of pasta, I think), add a couple fresh pieces of garlic bread, and pour yourself some Toscana - voila! Instant meal that's really quite decent. I think that you'll want it again - not that "it was OK, but I don't think that I'd get it again" feeling. Warmed up the sauce and noticed right away the vast difference between the picture on the box vs the actual product. Took one bite and indeed, it was more like chef boyardee than bolognese. Kids took one look at it and described it as looking like something that disagreed with you after dinner. It was not a hit. It was enjoyed however by the garbage disposal. This product used to be decent. Now it is horrible. It is so watery and tasteless. Just last summer it was denser and meatier. Please make it better! I just tried this. I added a splash of wine. Then I added some TJ's jarred Arrabiata sauce and had it over penne. YUM. Warmed up the leftovers tonight and added more Arrabiata sauce. Then decided to get weird with it and added a splop of TJ's alfredo sauce. YESSSSS. Awesome. Love your blog. I give it a 10. It pairs well with pasta. I did it with Rigatoni. I just bought this sauce and find it truly disgusting. I will make my own from now on. It's nearly as easy and tastes 100 times better.